connar is using Smore newsletters to spread the word online. Triton is the largest moon of Neptune. It measures 1,680 miles across. Triton was discovered 17 days after Neptune. 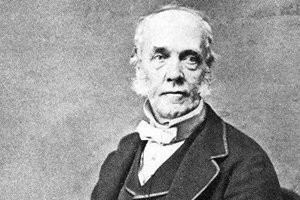 This discovery was made by British Astronomer William lassell on Oct 10, 1846. Triton was named after the son of the Greek god Poseidon. Triton is one of the few moons that is geologically active. It has volcanoes and geysers. The geysers shoot 5 miles high into Triton's atmosphere. The volcanoes create smooth volcanic plains. Triton also has craters. Triton's atmosphere is mainly made up of Nitrogen with some with some Methane Gas. The temperature on Triton is really cold, at -393 degrees fahrenheit. It is the coldest object in our solar system. Triton moves in a retrograde orbit and has a synchronous rotation around Neptune. 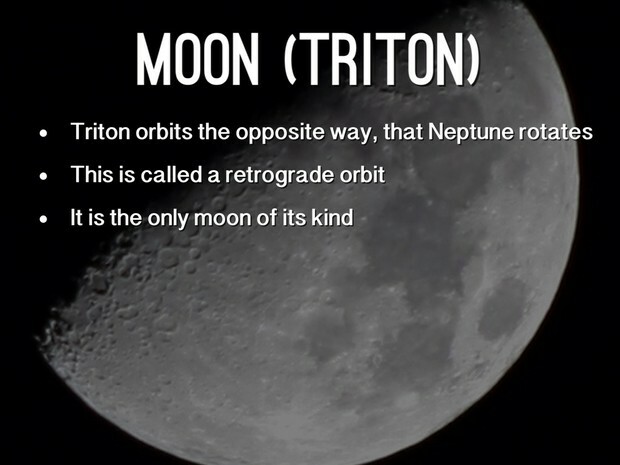 Retrograde means Triton moves in the opposite direction as Neptune. Synchronous means one rotation takes as long as one orbit. Triton orbits Neptune every 5.88 Earth days. Astronomers think that Triton was once part of the Kuiper Belt and was pulled into Neptune's orbit by it's gravity. In about 3.5 billion years, Triton will come way to close to Neptune's orbit and will break apart, causing Neptune to have rings. Recently, seasons have been discovered on Triton, summer and winter. One season on Triton lasts about 40 years. Triton just passed the summer solstice in 2000. Voyager 2 is the only craft to photograph Triton, which passed Triton in 1989. Brewer, Duncan. "Neptune." The Outer Planets: Uranus, Neptune, and Pluto. New York: Marshall Cavendish, 1993. 43, 44, 48, 49+. Print. Dunford, Bill. "Solar System Exploration." Solar System Exploration. N.p., n.d. Web. 07 Dec. 2015. Howell, Elizabeth. "Triton: Neptune Odd Moon | Space.com." Triton: Neptune Odd Moon | Space.com. N.p., Tuesday Aug. 2013. Web. 02 Dec. 2015. Neptune. Digital image. Haiku Deck. N.p., n.d. Web. Neptune's Moon Triton. Jan 4 2009. William Lassel. Digital image. Planet Facts. N.p., n.d. Web. "Windows to the Universe." Windows to the Universe. N.p., n.d. Web. 07 Dec. 2015.